The Dwa-suparNa mantra is a famous mantra occuring in the Mundakopanishad. Here I am recording a short explanation of this mantra according to the Advaita Sampradaya, laid out in the commentary of Shankaracharya to the Mundaka Upanishad. Caveat: The Upanishads are supposed to be understood from a traditional Guru. In such a Guru’s absence, one can try to listen to the lectures given by traditional Advaitic Acharyas like Swami Paramarthanandaji to understand the meaning of the Upanishads. This brief is simply to record my understanding and share the joy to those who have similar interests. tayoranyah pippalam svadvattyanashnannanyo abhicakashiti || 1|| (3.1.1 Mundakopanishad). Here the word vriksham, literally meaning “tree”, signifies the body. The verse speaks of two birds (on such a tree), which signify (a) the real “I”, the AtmA, and (b) the “ego-I”, the “apparent-I”, the ahamkaara. The real “I”, called AtmA, is spoken of here as a bird which ‘looks on’ – abhichaakashiti, which is the witness to all the worldly objects, as well as all experiences in the mind, including sorrow and happiness, anger and compassion, depression and joy, etc. It is untouched by any of these experiences. Nor is it a doer. It watches the mind and body go through and perform varieties of activities. It is unaffected by the actions themselves, and also of the result of actions (experiences). Therefore this real-I, the witness, the AtmA is simply ‘looking-on’, abhichaakshiti, it is simply Witnessing all the activities and experiences in the mind, body and the world. The apparent-I, the ahamkaara, is the I seen as being really associated with the body-mind complex. By taking this association to be real, one thinks of oneself as the doer (“I do such and such activity”), and the enjoyer (“I enjoyed such and such experience”). Thus, such an apparent-I, the ahamkaara, is spoken of here as the other bird, which is moving through the tree and enjoying (‘svaadvatti‘ in the verse) the fruits of the tree. Thus, to this bird, doership and enjoyership is associated, while the other-bird, the representative of the AtmA is simply looking at whatever is going on. The locus of both of these two birds is said to be a ‘vriksham‘, a tree. The tree is analogous to the body. The Upanishad wants to teach about the Saakshi, the Witnessing principle, the real consciousness, as being separate from the body-mind. However, it is teaching about the Witnessing principle not as an object of experience, but the real nature of the subject (the self) itself. In other words, it is teaching the truth of the seeker, the Vedantic student, himself. This subject, the real I, is easily available for understanding ‘within’ the body, as the seeker’s own self. Therefore the two birds are said to be on the same tree. This real-I is independent of the world, independent of body-mind, and independent of duality of any kind. It is the same I, the AtmA, which enlivens all beings as the pure consciousness principle. The Vedantic student, as long as he associates with the body-mind, is a doer/enjoyer and therefore a samsaari, a person caught in the vagaries of life, who has to depend on external sources for security peace and happiness. 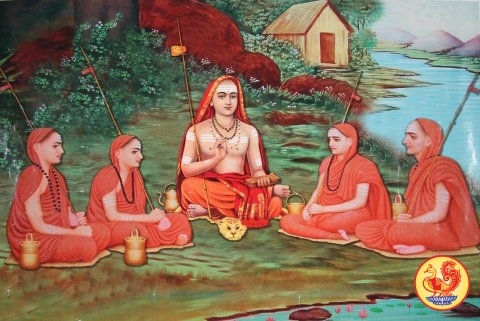 When the Vedantic student is able to separate the body-mind complex from oneself, through knowledge as revealed through Vedanta from a traditional Guru, then the Vedantic student understands oneself as the AtmA, the pure consciousness, the witnessing principle, and therefore becomes unaffected by whatever is happening in the body-mind. Such a person becomes emotionally independent of the world and the state of his body-mind to be happy. At the same time, because this pure consciousness principle enlivens all beings, the Vedantic student is at once able to relate to the samsaara of all living beings. Naturally both vairaagya (dispassion) towards enjoying the world through one’s own body-mind is strengthened in this person, and also the attitude of pure compassion, pure love towards all beings, is strengthened. This is known as Saakshi jnaana, and it is an intermediate step in the understanding of the Advaitic teaching. My pranaams to my AchAryAs for giving this understanding. I should confess that I have not explicitly listened to the teaching in this particular mantra. I have compiled this based on my understanding of Vedanta and my reading of the commentary of Shankaracharya of this particular verse. Yes, this is borrowed from Quora. Your Highness becomes I-ness? LOL :D.
Hari Om. Since sakshi jnana also requires the seperation between the BMI and the real self, how does this stage differ from establishment in the Self proper? Or, why is it only an intermediate stage? Namaste. Yes Saakshi jnaana involves drk-drshya-viveka. However there is still a difference between the witness and the witnessed at this stage. Any action done in the vyaavahaarika world involves certain level of identification with the body-mind. Therefore vichaara is not complete until there is advaita atma jnaana, i.e., the separation between the witness and the witnessed ‘disappears’. Here the word ‘disappears’ is not of the kind of destroying difference completely but in the form of knowledge of Satya vastu as advaita Atma as oneself and the witnessed as mithya or naama-rupa alone. After this saakshi-jnaana also recedes to the background and brahman alone remains. When interacting with the world, the jnaani may not be consciously telling “I am Brahman” or “I am saakshi” or so on, but underlying everything there lies the conviction “Only I (Brahman) exist”. This conviction in one’s purnatvam is jivanmukti, and the final goal. Saakshi-jnaana is intermediate because Brahman gets the name ‘saakshi’ in the presence of the saakshyam, witnessed-body-mind-world. With Brahma-jnaana all names are dropped.